Filles a Maman recently released a new top pattern in both adult and little girl sizing call the Extraordinary Girl. I love the look of the front panel so I quickly jumped onto the pattern tour! I made the tee for Bean since she is still in need of long sleeved shirts and I’m not sure this winter will be ending any time soon. The pattern has the option of long or 3/4 length sleeves and I chose to sew the long sleeves for the same (frigid) reason. 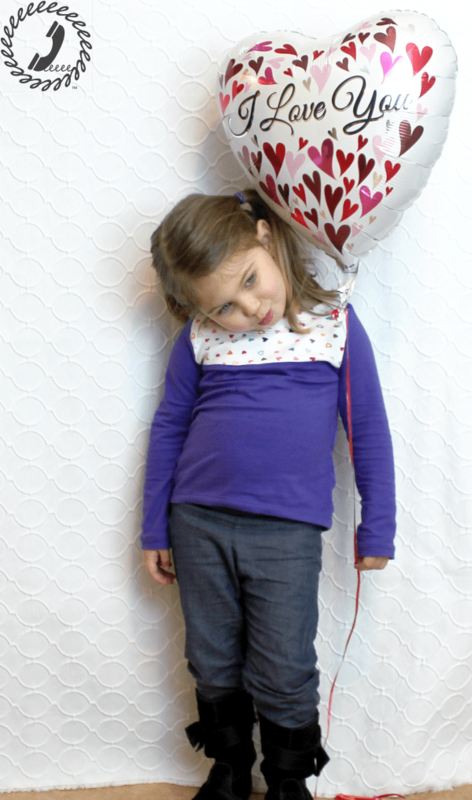 Though Valentine’s Day is behind us, we don’t really need an excuse to wear hearts around here these days so I used some heart fabric from my stash for the front yoke. The hearts were of course a big win with this 3 year old. 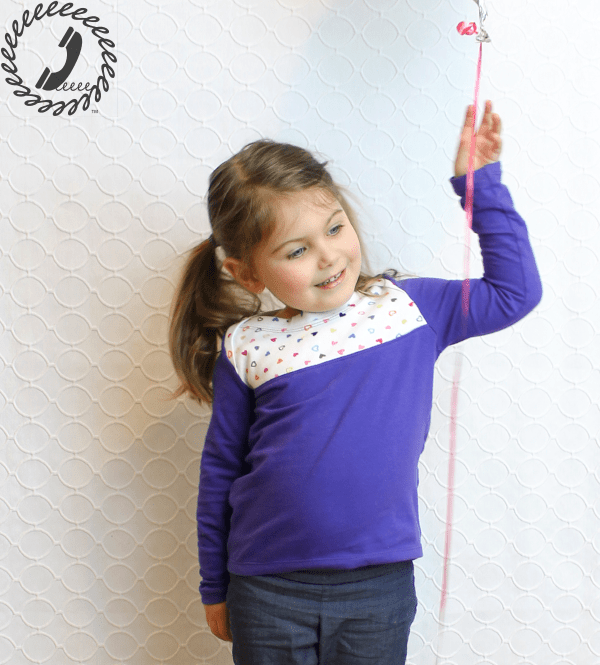 The solid fabric is this lugana cotton jersey (*affiliate link) from Imagine Gnats in the amethyst colorway. I need to stop for a second and talk about this fabric. 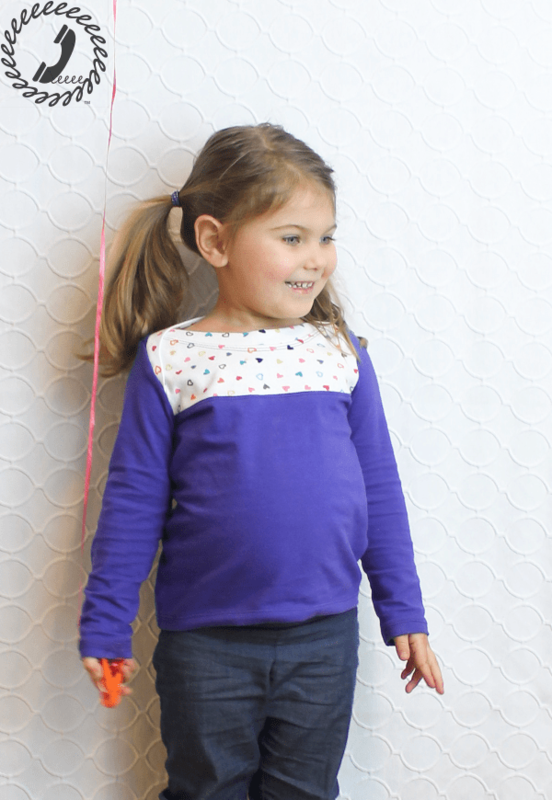 It is such a pretty color and for tees you can’t go wrong with her jersey solids. I made myself a tee with the navy before Christmas and I swear it’s getting softer with each wash. And given that I usually spend about twice as much on quality knit fabric, I couldn’t be happier to find a fantastic basic that holds up! Okay, back to this great top! The hemline is slightly high low so the back has a lower curved hemline than the front which is always welcome. I made the 4t which by the chart should be a little big on Bean and it turned out just as thought. 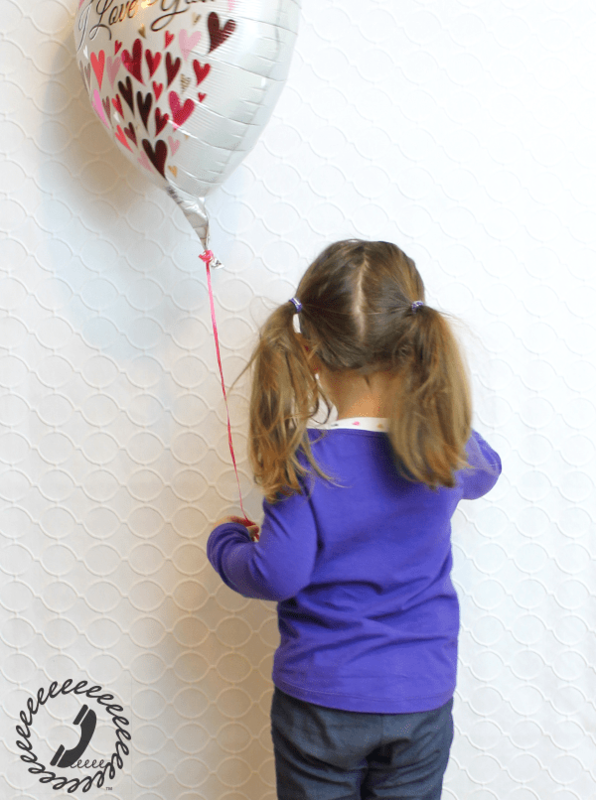 The length of the arms and hem have a little room to grow in case she hits a growth spurt before the warm weather comes. 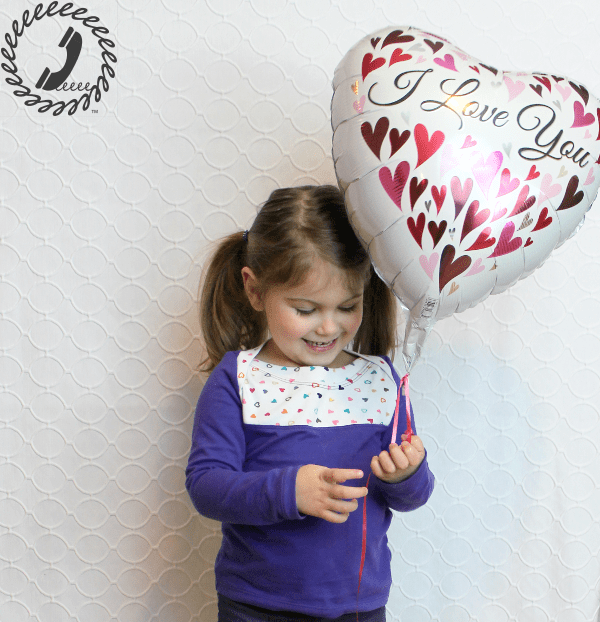 The girls’ pattern runs from sizes 12M – 14 which is a huge range. During the tour you can get the girls’ pattern for only $7.00 which is a steal! The women’s sizes are XS-XXL which correspond to about 0-20. You can purchase both patterns in a bundle for $13.00 for a limited time so scoop them up soon! There’s a giveaway for the tour that you’ll want to enter so check out the details below. I’ll leave you with this hilarious pic of Bean. She wanted to “pose” for pictures so we were picking out lots of different things to do (ie smile big, put your hands in the air, twirl around), and when I said smile small this was the magical pose. She’s started to get into the picture taking thing and it’s been fun watching her interact with the camera vs me chasing her around and trying to snap a pic or two which is how we always did it before. Fingers crossed that her enthusiasm continues! I’ll be posting later today to kick of the February Monthly MashUp week which I’ve been so eager to show you! 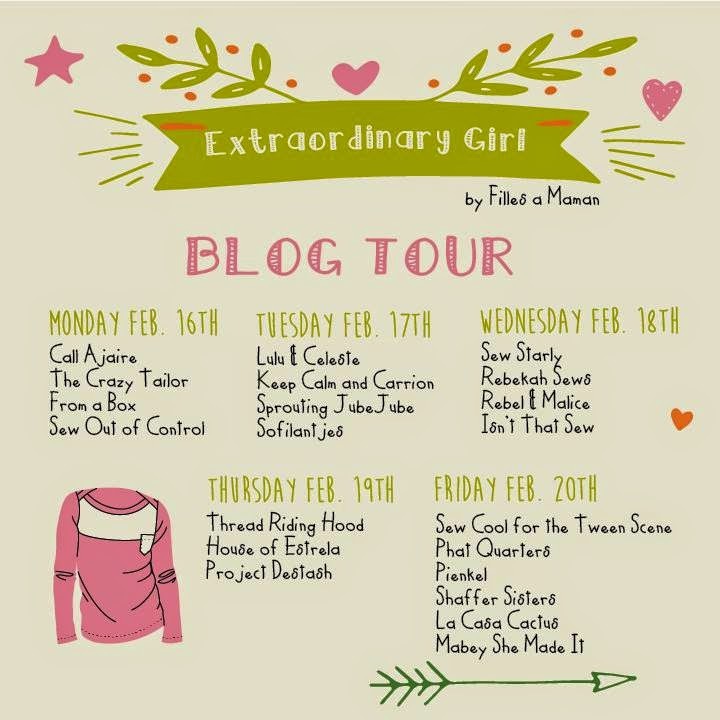 In the meantime, check out the other ladies posting their Extraordinary Girl tees today!